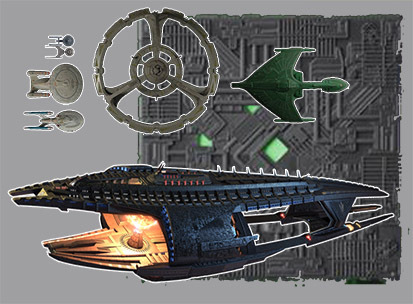 Mirror Universe May ends for Starship Sundays with a ship not seen in the Core Rulebook, the Imperial Palace and flagship of the Terran Fleet: the I.S.S. Charon. Basically a mobile space station, the Charon shows that while the Terran Empire was able to replicate the Constitution-class, these ships were not the pinnacle of engineering they were in the Prime Reality. I considered adapting other Mirror Universe ships, such as the NX-class. But these wouldn’t differ much from their counterparts in the Prime Reality. (In retrospect, the Terran NX Enterprise probably would have been a more interesting choice than the I.S.S. Defiant, as its Systems are more likely to vary, while the Defiant was literally built using the Prime Reality’s blueprints.) But the Charon brings something completely different into the game. Figuring out the scale of the ship was initially tricky. Rewatching a few clips of the ship helps, as there’s a scene where the U.S.S. Discovery flies through the Charon at a fairly constant speed, allowing me to determine a comparative length. This reveals the ship is almost comically large. It’s pretty ridiculous. But, considering the size of the Earth Spacedock, not outside the engineering capabilities of Starfleet in the Prime Reality. The Charon could be the Big Bad in a Mirror Universe rebellion game, where the players take the role of non-Terrans fighting against the Empire. It’s basically their Death Star… Theoretically, a second ship of its class could be constructed in the late 23rd Century for a Mirror Universe game in that era, possibly with the players working to seize power and become the Emperor themselves. Or even with the players taking over the role of Spock and his close allies, telling the story of how Spock becomes commander-in-chief of the Empire. The Charon would be a great prize for the end of such a campaign, or even a midpoint as the game shifts to quashing any resistance and restoring order. In the Prime Reality, this stat block could be a similarly massive alien vessel in the Prime Reality, such as an unseen species. The ship is technologically (i.e. its Systems numbers) in the range of The Original Series vessels. This means it would be somewhat inferior to a ship in The Next Generation era, but its size would still makes it quite formidable. It could also be fun to have a game set in the Kelvin timeline, where the events in Discovery did not occur and its Mirror Universe might decide to invade or a a different Federation crew might find themselves confronting the Charon. Huh. So the last ship for MU May is basically a floating palace. Nice.